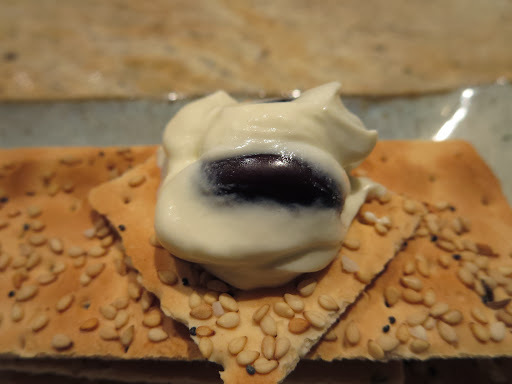 Kuromame 黒豆 or “black beans” are practically only eaten as part of the New Year’s dishes. Reportedly, it is not related to Western “black beans” but are a type of black soybean (Recipe in English is also found here). I have not ever prepared New Year’s black beans myself but instead bought them from the Japanese grocery store. More recently, they have been included in Sushitaro Osechi. Although we always enjoy kuromame on new year’s day, we tend to forget we have kuromame and find them much later tucked in the back of the refrigerator. I saw an interesting recipe to use kuromame on the Internet and decide to try it. I did not do a good job presenting this dish (some embellishment such as some parsley etc would have helped) but it is too late. I used Greek yogurt (or you can drain regular yogurt to make “greek” yourself). Using my own instinct, I added a bit of good fruity olive oil and salt to the yogurt and mixed in the cooked black beans. It tasted good but I mainly tasted the Greek yogurt. 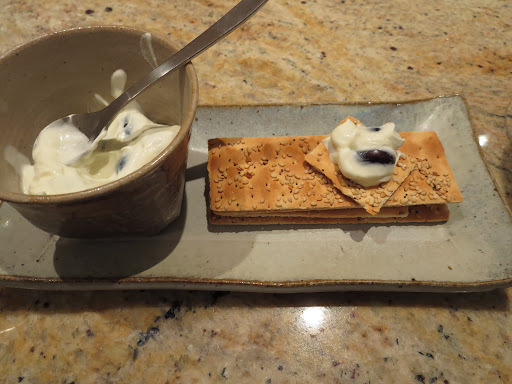 The black beans added texture and some sweetness in contrast with the sourness from the yogurt. This is a good way to finish off the kuromame .